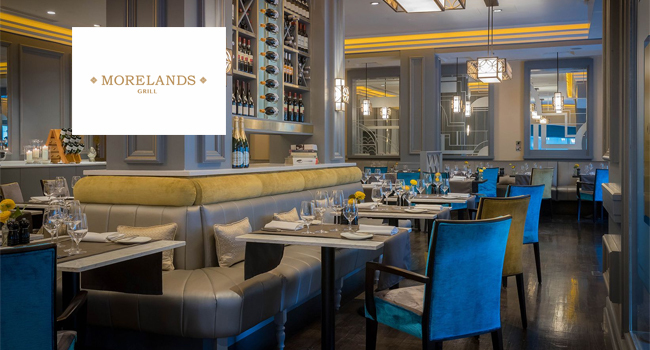 Morelands Grill is located beside The Westin Dublin on Westmoreland Street and the newly opened luas line in the heart of the city centre. The entrance to Temple Bar on Fleet Street can be seen from the restaurant’s elevated windows while Trinity College Dublin is practically a next door neighbour. This restaurant is the perfect place to lounge and watch the world go by in the heart of Dublin. Morelands Grill offers guests an exceptional dining experience by grilling their signature dishes on a Spanish Josper Charcoal Grill. The Josper Grill boasts temperatures exceeding 500 Degrees Celsius while giving dishes a unique charcoal flavour. The grill is the hottest indoor barbecue available in Ireland and it has the capacity to enclose heat, resulting in succulent meats and flavoursome grills. The Jazz Lunch at Morelands Grill is served 12.30pm to 3.30pm on Saturdays, and includes delicious food, fabulous wine and jazz- the perfect combination for a leisurely Saturday. TheTaste offer includes a two course lunch for 2 with a complimentary half bottle of wine to be shared by two persons, and live Jazz entertainment for €49. · Additional beverages, side orders, courses & tea or coffee are charged additionally.